We are ready! The Domi Sweat pants release is here. It has been so much fun designing this pattern. 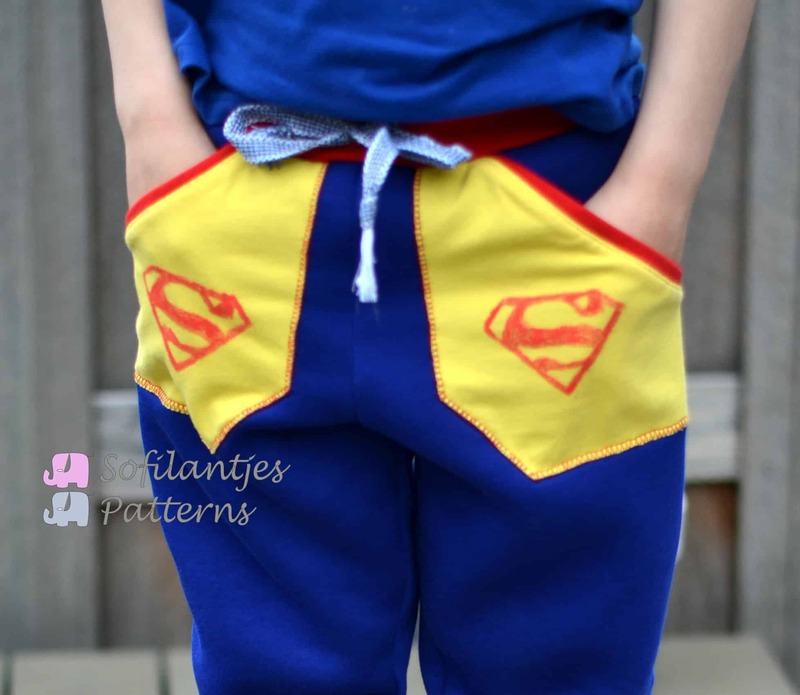 I actually started this pattern design to make my son a superman pants for my Mystery Challenge Theme, Andy Warhole. See the post HERE. After those versions I have made 6 more pants for my kids. Sadly I only have 3 of them on camera. But those that are on camera are my favorites and have been in and out of the washing machine a lot. If they make if through summer I will be surprised. They are one of the first items my kids will pull out of their closets. I can’t blame them though. Those pants look and feel so comfortable. The Domi Sweat pants come in sizes 12M/80 to 14y/164. It is a Unisex pattern. There are three length options and two pocket options. The pockets are perfect for details like the Superman logo above or adding a sweet flower. Size 4 full length in sweatshirt fleece with round pockets option. I have made both my kids a long version out of sweatshirt fleece. They love it. The inside is really soft and the fit of the pants is perfect to relax in. Plus, who can top a superman pants. 3/4 version in French Terry with round pocket option. The 3/4 length is designed to fall just under the knee but if you prefer it longer you can easily lengthen them to your prefered length. There is a finished measurement chart included in the pattern instructions. Bermuda Shorts in French Terry with round pocket option. The Bermuda Shorts version is hemmed and gives a more boyish look but looks great on girls to. The length is just above the knee, but again very easy to lengthen. Now for the best part. The pattern is on SALE for two days only. You can get it for only $5 (excl. tax). After the sale ends the pattern will be $8.95. Be quick and get your own pattern HERE in our SHOP and start sewing. Also, be sure to check out our Facebook group for questions, inspiration and some fun giveaways that are already planned. This pattern makes up comfy sweat pants for girls & boys. They are easy to put together. And the pockets provide a creative area for sewing Moms to make the pants personal for their kids.